Here at Tungsten World, we say that’s just “Madness!” We love the NCAA Tournament so much, we got in the spirit by holding a bracket of our own this March. We’re pitting eight of our most popular tungsten wedding bands styles against one another in a showdown to determine the Tungsten Ring of the Year. Running on the Tungsten World Facebook and Tungsten World Google Plus accounts, tungsten ring fans will have until April 4th to vote for their favorite. The winning tungsten ring will be rewarding its supporters with a special $50 off week-long price. 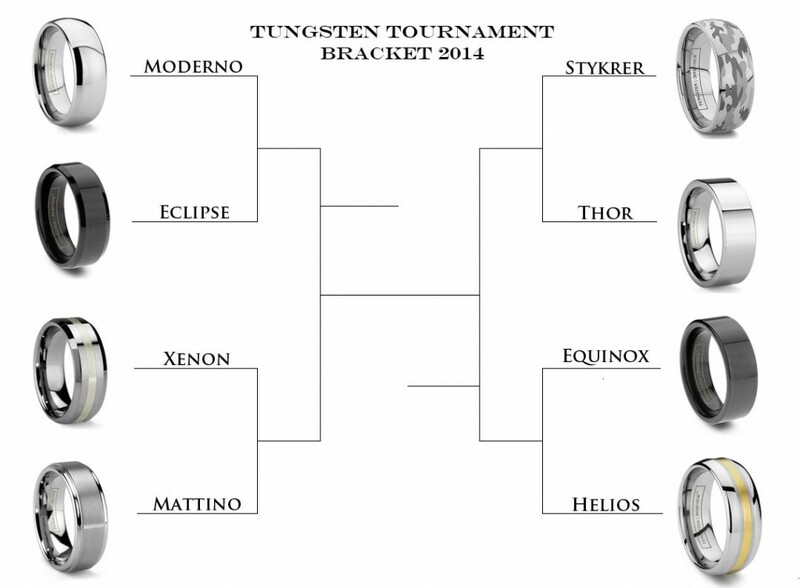 All customers that vote will receive $35 off their next order at Tungsten World and are encouraged to share the Tungsten Tournament bracket with their friends on Facebook and Google Plus. One lucky “sharer” will be selected to receive a free tungsten pendant prize. This entry was posted on Thursday, March 20th, 2014 at 6:35 pm	and is filed under Tungsten Rings. You can follow any responses to this entry through the RSS 2.0 feed. You can leave a response, or trackback from your own site.